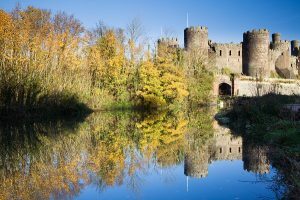 If you’ve been researching the many wonders that a visit to Wales has to offer, then there is little doubt that somewhere down the line you’ve stumbled across the many, many castles which pepper our landscapes. In fact, Wales has so many of these ancient relics that deciding which ones to prioritize to visit during your time in Wales can be a bit of headache. So, based on my personal experience – as well as my proud heritage as a Welshman – below is a compiled list of the absolute must visit castles during your tour of Wales. Cardiff Castle: Cardiff, South Wales. 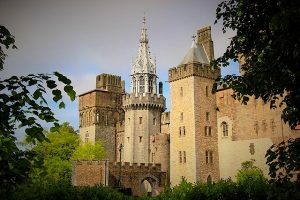 Starting with the obvious; situated in the heart of the Welsh Capital of Cardiff, Cardiff Castle needs ticking off anyone’s must-see list during a visit to the city. The settlement itself dates to the Roman era – the first to inhabit the site – later changing hands to the Normans, and eventually the Tudors. Enjoy an escorted tour of the castle grounds and the gloriously opulent mock Tudor mansion for a day that the whole family will enjoy. Right on the border of Wales & England, this medieval marvel was not originally built with battle in mind, although it withstood a siege for 13 weeks during the infamous Civil War in the 17th Century. Raglan Castle once boasted status as grand as any castle in all of England & Wales and has stood the test of time to this day. 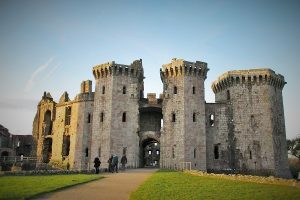 Just a short drive across the Severn Bridge, Raglan castle is a must-see Wales castle during your visit to Wales and England. Conwy Castle: Conwy, North Wales. Not only is the north of Wales home to the country’s most spectacular coastline and spell-binding mountainous landscapes in the Snowdonia National Park, it is also home to one of Wales’ most impressive fortresses; Conwy Castle. This impressive castle overlooks the Conwy estuary and has long preserved the medieval character of Conwy town with its walls still encircling the entire town to this day. Be sure to wander the castle grounds and walls of this fabulous castle during your time in north Wales. Caernarfon Castle: Caernarfon, North-west Wales. Few castles in the world possess such an almighty aura that Caernarfon castle does, which is inherent of its original purpose. 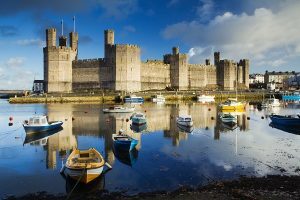 Caernarfon castle was built under the rule of King Edward and the castle’s intimidating appearance was no coincidence, as the Monarch’s grip on the Welsh natives tightened throughout 13th century. Now officially recognised as a World Heritage site, Caernarfon is a glorious beacon of strength and power and was the venue of the investiture of Prince Charles as Prince of Wales in 1969. Laughlarne Castle: Laugharne, Carmarthenshire, Wales. 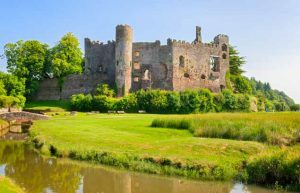 Heading back down the south coast of Carmarthenshire and to the final home of Wales’ most famous poet, overlooking the estuary of the river Taf stands Laugharne castle, in the quaint town of Laugharne itself. Dylan Thomas’ residency has left an undeniable mark on the town, but it’s history goes far deeper, with the castle being a testament to the town’s complicated & troubled past. The castle was used as inspiration for some of Thomas’ later works and is a must-visit Welsh castle. Be sure not to miss out on the opportunity to visit these wonderous fortresses during your customized driving tour of Wales. Leap back in time into Wales’ rich, eloquent & brutal history. 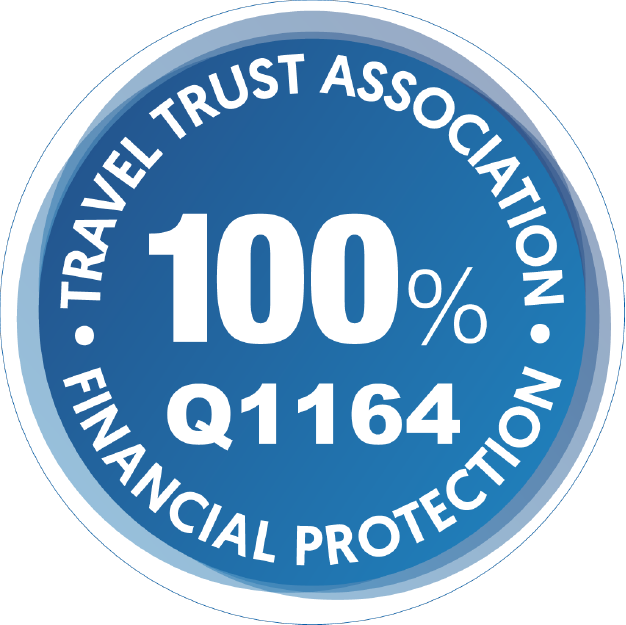 Include admission to any, or all the above castles into your vacation package.